The BlackBerry KEY2 is an brand new phone trying to coexist with an old-school form-factor, and struggling all the way. When it comes to capturing nostalgia, TCL – which has been licensing the BlackBerry brand for smartphones since 2016 – has done an excellent job. Problem is, there hasn’t been quite as much success in making a must-have smartphone. Indeed, the KEY2 reviews are in – ours included – and the general consensus is that, while physical keyboards have a certain charm, that doesn’t really mesh with 2018’s priorities. Like the KEYone last year, there are some inherent compromises you simply have to accept when you decide to squeeze a full set of QWERTY keys onto the fascia of your candy bar phone. In the case of the BlackBerry KEY2, handing over the bottom quarter of the handset to the keyboard means there’s only enough space left over for TCL to fit a 4.5-inch touchscreen. Contrast that with the LG G7 ThinQ, which is about the same height and width, and yet accommodates a 6.1-inch display. There are clearly some significant advantages to only showing a keyboard when you require it. TCL’s designers have done a pretty darn impressive job of remaking the classic BlackBerry keyboard for a modern Android device. They apparently took inspiration from the BlackBerry Bold 9900, a seven year old phone that still has its fans by virtue of its deeply tactile keys. If you’re looking at keyboard performance alone, it’s certainly not a bad place to start. If you’re hoping to get ideas to make a full smartphone, though, the Bold 9900 would be a terrible model. The way we rely on our smartphones has changed considerably since 2011: screens have grown larger and larger, because we’re consuming more content. Not just photos and videos, but apps, full productivity suites, and more. In that respect the KEY2 feels like a retro throwback a lot of the time, and not in a good way. When you’re messaging, or replying to emails, there’s a lot to like about its keys. The rest of the time, they’re just taking up the space that a bigger screen could’ve made better use of. TCL compounds that by dedicating a big chunk of space between the bottom edge of the touchscreen and the top of the keyboard, just for the touch-sensitive back, home, and app switcher buttons. Look, I’m perfectly happy with onscreen keyboards at this point. The flexibility of having a QWERTY keyboard show up when I need it, then disappear when I don’t is, personally speaking, far preferable to having a setup of physical keys that permanently take up space. The fact that onscreen keyboards can switch layout to suit different languages, or show emojis, or all of the various symbols we require, make them – again, speaking personally – much more useful. Nonetheless I concede that some people still like a physical keyboard. There’s a lot to be said for muscle memory, and your fingers ability to home in on the right button without you necessarily needing to look down at where they’re tapping. What I’d like to see is TCL look to a different part of the BlackBerry back catalog for 2019’s KEY3 (or whatever it ends up being called). That’s the BlackBerry Priv. I’ll forgive you if you wiped the Priv from your memory. Released in late 2015, it was the last gasp of BlackBerry Limited’s hardware aspirations, and the first to run Android. Combining a full-touch design with a slide-out QWERTY keyboard, it promised the best of both worlds. It’s hard to describe the Priv as a success, exactly. Reviews were fairly average, with praise for the form-factor tempered by its subpar specifications and stupidly high price. Sales, meanwhile, struggled. Despite company execs trying to put a positive spin on the situation, the $699 unlocked price tag left only the most dedicated BlackBerry fans willing to jump onboard. By the time it reached end of life in December 2017, you couldn’t exactly say anybody would miss it. That might not seem like much of a grounding to build a new BlackBerry slider from, but TCL has shown that it can surprise us. What the KEY2 gets right – and what the KEYone got right before it – is the fundamentals. TCL opted for a midrange Snapdragon processor rather than a flagship chipset, because it’s both cheaper and more frugal. It paired that with a huge battery, and together they deliver ridiculously solid battery life. Two days of regular use is eminently achievable. You still get a headphone jack, and a microSD card slot. Plus TCL doesn’t cut corners when it comes to build quality. The BlackBerry KEY2 feels, with its machined aluminum, textured rubber, and toughened glass, like you could hurl it to the floor in a fit of pique, and still be able to sheepishly pick it up again and carry on replying to emails. 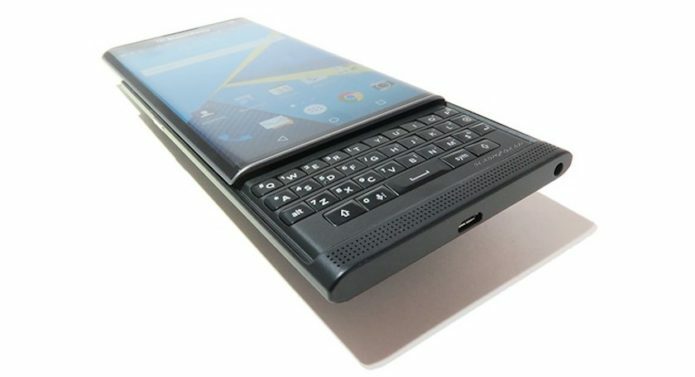 What I’d like to see, then, are the lessons of the KEY2 applied to the Priv, for a thoroughly modern BlackBerry. Metal, not plastic, for the chassis. The clever physical keyboard that doubles as a fingerprint sensor and as a trackpad. Battery life measured in days, not hours, and a focus on Getting Things Done with shortcut keys and practical apps. I don’t mind a more humble processor, if it’s done in the name of extending usable battery life. The KEY2’s dual rear camera array can stay, too, though I think TCL could do with getting some fresh blood in to rework its image processing algorithms: low light performance in particular is pretty woeful on the new BlackBerry, though even well lit shots can show an off-putting amount of grain. All that, though, combined with a full-sized screen that reflects the reality of today’s mobile web and app environment. I don’t believe physical keyboard fans should be left without an option, but I also don’t believe they should be left behind when it comes to experiencing the same rich software environment that mainstream phones offer. I can’t, honestly, say that the KEY2 achieves on that front. It’s not a small challenge for TCL, I realize. The KEY2 has already crept up the pricing scale compared to its predecessor: whereas $550 would’ve got you a KEYone at its launch last year, you’re looking at $650 for an unlocked KEY2 when it begins shipping around the end of the month. Anything that adds physical complexity, like a slider mechanism, comes with the risk that it’ll compound that escalating bill of materials and make for a more expensive phone. If the company is serious about bringing the BlackBerry – kicking and screaming – into the modern era, however, it needs to do it properly. That means, if you’re committed yourself to a physical keyboard, then choosing the form-factor which delivers that in the most flexible, practical way. I don’t know if TCL sees things the same way I do, of course. However, if it does, we may not even have to wait until 2019 in order to find out. Back at the top of the year, we were promised not one but two new BlackBerry handsets in 2018. Here’s hoping that the second time is the charm.